Virginia Beach is the state's largest beachfront resort area. 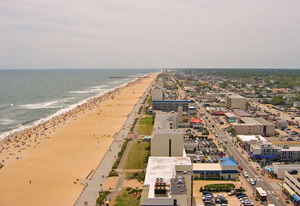 Virginia Beach has been a popular beach vacation destination for years. In addition to the beach, there's plenty of other activities along the oceanfront strip and in outlying areas to keep vacationers occupied. The city has put a lot of money and effort into updating and improving the appearance of the Atlantic Avenue strip and the boardwalk. Virginia Beach is looking good these days - and there's an ever-increasing line up of activities and concerts being hosted to keep visitors entertained. The Resort Strip - This is where the hotels and the boardwalk are and is the most active area. It's the area between 1st Street and 42nd Street. The North End - The residential area north of 42nd Street. This is the beach's oldest neighborhood. It's mainly a neighborhood for full-time residents, but there are vacation rentals here too. Croatan Beach - The residential neighborhood south of Rudee Inlet. A quiter alternative to the strip while still close enough for a short trip to restaurants and attractions. A mix of full-time residences and vacation homes. This is a popular beach for surfing. Sandbridge - The southern-most beach area. There are lots of vacation rentals available here. Located about a 15 minute drive from the resort strip.